We don't have to have an "annual fishing trip to Canada" - we have it year-round! A survey showed fishing was America's 5th most poular sports activity, and tops all other water sports. Powerboating was #10, canoeing #33, waterskiing #35, and sailing #44. Ontario fishing is regulated by federal and provincial laws. The Fisheries Act of Canada protects and conserves fish stocks, and the Ontario Game and Fish Act deals with licences. Residents between 18 and 64 need a licence to fish in Ontario. People from outside Ontario need a Non-Resident Sport Fishing Licence. You may purchase any fishing licence at local Ontario MNR (Ministry of Natural Resources) offices, tourist outfitters, bait shops, and sporting goods dealers. You may buy an Outdoors Card & Fishing Licence at any of 60 ServiceOntario kiosks or phone toll-free any time 800-288-1155. For the Outdoors Card & Hunting/Fishing version, phone 800-387-7011. See our Government Directory: Ontario for more information and The Guide to Eating Ontario Fish. There are some excerpts from the Regulations. Ontarian residents from 18 to 64 years of age have to buy a licence fish. There are excemptions for "disabled persons", children under 18, people 65 years and older, and Status Indians. Residents (people who resided in Ontario at least 7 months during the previous 12) may buy a Standard Fishing Licence or a Resident Conservation Licence. An Outdoor Card is a Conservation License good for 3 years. Residents outside Ontario may buy these licences, but the disability exemptions do not apply. Americans who fish in Canadian waters require a Canadian Outdoors Card (valid for three years), the same as for Canadian residents. Americans may take a U.S. state-registered boat into Canada for up to 45 consecutive days without requiring a Pleasure Craft Operator Card. Non-Canadian visitors should read the U.S. visitors page. Non-residents fishing in Canada can no longer take baitfish. They must buy minnows from local dealers. A Conservation license permits you to keep 2 for most general types such as Bass. Other limits: 2 Salmon/Trout combined, 1 Lake Trout, 12 Whitefish, 25 Yellow Perch, 10 Crappie. There are other like Muskellunge, Atlantic salmon, and Aurora Trout that you are not allowed to keep any (if you can ever catch one!). Any catch that exceeds limits must be quickly and carefully released. It's also illegal to catch fish below a canal, dam or fishway. Read the Regulations for a complete summary! Carry that card when you go fishing! It's an offence to not hand over the licence card if asked by a conservation officer. A sport-fishing licence allows a visitor to fish with hook and line and sometimes you can use a spear or bow in certain areas. A licence allows you to catch baits except in provincial parks. Fisheries officers have broad powers. They may enter any premise, vehicles or boat without a search warrant to look for an illegal catch of fish! Any equipment used by a person committing an infraction can be confiscated by an officer. They may seize tackle, cars and boats! Renew your Outdoors Card is easy. Gather your Outdoors Card and Visa/MasterCard and phone 1-800-288-1155 (24-hours a day). You can also renew at one of the 60 ServiceOntario Kiosks for renewing licences. Everyone has the same rights and responsibilities, including limits on fish. Catch limit is the number of fish you are allowed to catch and keep in one day, including those you ate. Possession limits include fish in your boat, in your freezer at home, in your car. It is illegal to catch, possess, or "try to catch" an illegal fish. You must immediately release an illegal fish to the water (see below). Penalties are fines up to $500,000, prison term up to 2 years, or both. The penalty for harming fish habitat, including placing harmful substances in the water, is a fine up to a million dollars or prison up to 3 years, or both. Did you know that the large mouth bass is actually a member of the sunfish family? In Ontario, it is illegal to buy, sell, or possess live Asian carps. Conservation officers spend approximately 2,000 hours a year on inspections, covering dozens of wholesale and import companies that work through more than a thousand different locations. Don't play a fish to exhaustion - it will not likely survive even if you release it. Don't use rear hooks on your lure so that you don't hook the eyes or body cavity. Don't use large hooks - proven to increase death-rate on released fish. Release only healthy fish that will survive. Use heavy test line so the fish do not have to try to survive with your light mono and hook. Have plyers or sidecutters handy to remove hooks. DON'T use a net. This deslimes them - slime protects their skin from parasites and infections. Don't handle the fish more than needed - get it back into water quickly. And if you catch that record muskie, please release the fish and mount a photo. That gene pool is worth saving for future generations of big fish. Release the fish immediately for it to survive. In deep water, bring fish up slowly to prevent stress. Keep the fish in the water if possible. Don't let it flop on a hard surface (like your boat - this causes de-sliming of the skin). Handle the fish gently. Keep your hands wet. Don't put your fingers in the gills or eye sockets! Lift small fish by the lower lip. Remove hooks quickly by twisting it out or using long-nosed pliers. Never tear out hooks. If a hook is deeply caught in the fish, cut the line and leave the hook in. If the fish is unconscious, revive it by holding it upright in the water, facing it upsteam. Move the fish forward so that water runs through the gills. When the fish begins to struggle, release it. Never put a fish on a stringer that you want to release. Use a live well or release as above. While fishing from shore allows you to catch fish well in many areas, using a boat can open up new opportunites. Boats let you fish in a much larger area, and carry more gear in comfort (or not, if you don't have canvas). Your choice of fishing boats is determined by factors such as where you fish, what gear you carry, and money - yes, it always comes down to money doesn't it? A popular fishing boat would be a 16-foot aluminum boat with an outboard motor. A good 14-foot boat could handle two or three people and their gear. 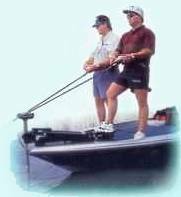 A 6 or 9 HP outboard motor will provide the power you need to get to your favourite fishing spot or for trolling. Small aluminum boats can be carried on top of your car. Larger or heavier boats will need a trailer. These can handle boats up to 25 feet. Anglers should be aware that an Pleasure Craft Operator Card is required for operators of all boats with a motor (fuel and electric). Oh, and don't forget to put the life jackets on BEFORE you all end up in the water and drown. Alcoholic beverages in boats - summary of laws, discussions. Loons - the iconic birds of Canada's inland lakes. Government Directory: provinces for fishing licences and environmental regulations. You can upload your fish photo (85k) to Dan Good's bulletin board www.outdoorpost.com.